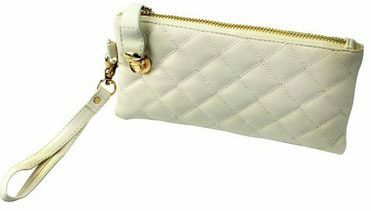 White Leather Wristlet Only $5.98 + FREE Shipping! You are here: Home / Great Deals / Amazon Deals / White Leather Wristlet Only $5.98 + FREE Shipping! Looking for a wristlet but don’t want to spend a lot? I have a great one for you! Get this White Leather Wristlet for just $5.98 + FREE shipping! I can never find a wristlet big enough to fit my Samsung Galaxy phone when it’s in its case, so I’m excited to find this one! I’m totally grabbing it. And, there are separate compartments for your phone and money, credit cards and whatever else you need to carry with you! That means nothing falls out when you grab your phone!